This book undertakes a scholarly assessment of the state of the art of law and policy perspectives on groundwater and climate change at the international, regional and national levels. A particular focus is given to India, which is the largest user of groundwater in the world, and where groundwater is the primary source of water for domestic and agricultural uses. The extremely rapid rise in groundwater use in many Indian states has led to a growing groundwater crisis that they must address. The existing regulatory framework has not adapted to the challenges and fails to address any environmental concerns. On climate change, India has adopted a policy framework that makes the link with water, but no legislation has followed up to make the link operational. The subject matter of this book has been widely debated with regard to each of its main two components separately. Bringing these two domains together is what makes this book unique. The link between climate change and groundwater has been acknowledged to some extent, and there is growing interest in studying the impacts of climate change on (ground)water. Similarly, in water and environmental law and policy, increasing attention has been given to the study of climate change and groundwater legal and policy frameworks but generally separately. 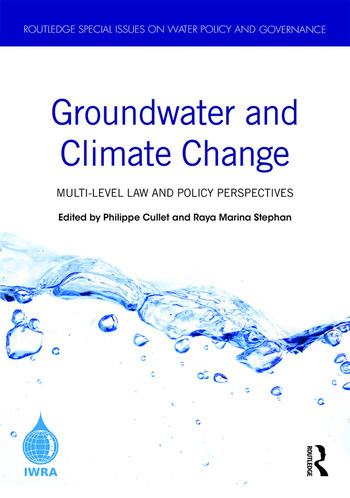 This book contributes to filling this knowledge gap by drawing on contributions from leading experts in the field of environmental and water law and policy who have been involved in climate change and/or groundwater research. The chapters in this book were originally published in a special issue of Water International. Philippe Cullet is Professor of International and Environmental Law at SOAS University of London, UK, and a Senior Visiting Fellow at the Centre for Policy Research in New Delhi, India. Raya Marina Stephan is an international consultant, expert in water law. She works in international projects related to water management and transboundary waters, with a special focus on groundwater.